Map showing area of this report. BA – Burma Army activity. At 10:25 AM, 15 Burma Army trucks carrying troops from LID 99 and 5 trucks carrying around 35 horses were going back to Bhamo in Kachin State. In KIA Battalion 2 area under 4th Brigade, an estimated 200 troops from IB 136 arrived at Mung Ji and troops from another battalion with 8 military trucks arrived at Ta Mu Nya from Kuthkai. 60 troops from IB 145 arrived at Nam Hkai and about 50 troops from IB 323 arrived at Man Lung. At 8:30 PM, in territory of KIA Battalion 34 under 4th Brigade, an estimated 100 Burma Army troops with 6 trucks arrived at Man Dung in Northern Shan State. About 150 troops from LID 33 arrived at Gang Dau Yang. A road crew unit from LID 33 with one bulldozer arrived at Na Hpaw in the area of KIA Brigade 5, in Wai Maw Township, Kachin State. In territory of KIA Brigade 2, Battalion 5, Burma Army IB 141 and LIB 309 arrived at Pang Hkaw Yang. IB 39 led by Lt. Col. Myu Min Nawng and Major Kyi Hkai divided and did military operations at Wa Wang Bum and Myu La Villages in Shwegu Township, Kachin State. 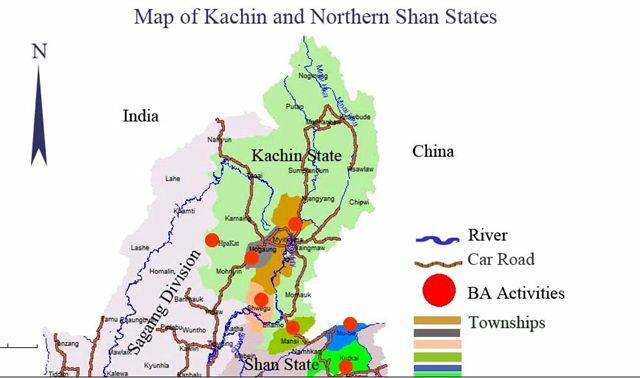 At 3:30 PM, in territory of KIA Brigade 5, Battalion 3, troops from Burma Army LID 88 with 15 military trucks went from Man Dawng to Wai Maw where IB 58 is based in Kachin State. At 14:00 PM, 20 Burma Army trucks carried rations and ammunition from Bhamo to Daw Hpun Yang. Burma Army IB 241 and IB 568 launched attacks on Dak Let Bum, where KIA civilian militia MHH and KIA 9th Battalion troops were stationed under KIA’s 4th Brigade in Kut Hkai Township, Northern Shan State. Fighting occurred at 10:10am and again at 4pm. At 07:00am, TNLA troops defended against about 60 troops from Burma Army IB 45 as the Burma Army troops attacked in territory under KIA’s 8th Battalion, 4th Brigade, around Loi Lung, Nam San and Man Sai Hkau Villages in Northern Shan State. At 10:00pm, Ta’ang National Liberation Army (TNLA) troops defended against about 60 troops from Burma Army IB 45, which was making attacks in territory under KIA’s 8th Battalion, 4th Brigade, near Man Pang Village in Northern Shan state.